Why Rainbow Play Systems Swing Sets & Playsets? Rainbow Play Systems are made from 100% All-Natural Cedar that is naturally insect and decay resistant and does not need dangerous chemical pressure treating. This means long-lasting performance without the need for harmful chemical treatments that many other types of wood require. Rainbow Play Systems, located in Brookings, SD and distributed through distributers and dealers nationwide. Backyard play equipment safety guilelines are set by The American Society for Testing and Materials (ASTM), working with the U.S. Consumer Product Safety Commission (CPSC). Rainbow Play Systems is proud to offer you the Best Warranty in the industry with our Lifetime Warranty and Guarantee. Redwood: Strongest For The Longest. Rainbow constructs its playsets from sustainable Redwood. What makes these beautiful woods best for outdoor playsets? They are strong, dimensionally stable, and resistant to both insects and deterioration. And the exceptional strength of the woods we use make Rainbow Play Systems safe for heavyduty use and kids of all sizes (even Dad). Your Rainbow Playset will be enjoyed for years to come. Hey Dad - Let's have a Swinging contest! Bigger Beams. Our redwood lumber premium grade and is hand selected for each component and dimensionally larger than our competitor's - giving our sets greater stability. We begin with hand-selected, premium timbers that are sawn to be free of "heart center." This promotes stability and reduces warping, twisting, or cracking. We mill our own timbers to be bigger and stronger. 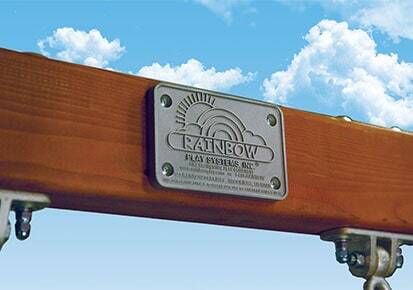 Rainbow beams measure up to true construction grade dimensions—we never whittle them down. Rainbow's Adjustable A-Frame designs makes it easy to install in an un-level yard. The A-frame legs can be moved closer together or spread further out to account for an upward or downward slope! We can even order longer A-Frame Legs for your swingset, or even a longer rockwall. How about that? All the entries into a Rainbow Play System are taller than average. This makes getting into the playset much easier. Cheaper sets have less than 20" tall openings, making it almost impossible for larger children and adults to play. Rainbow's 31" tall openings are perfect for all sizes and gives your family the ability to enjoy playing for many years to come without outgrowing your playset. Notched redwood braces provide added structural support minimizing the load on hardware and reducing the frequency of maintenance. FIRM & SOLID. All of our decks (and all of the wood on our playsets) are sanded smooth nice and safe for your little ones. Full Dimension Lumber, definately not thin inferior lumber. Call it beefier, it makes your playset more solid and rigid. Even dad can play! Did you know that a Rainbow Play System has a lot of Headroom? Perfect for your children, they don't have to worry about where they are standing in the playset to watch out for the roof! Adults who like to play inside the set tell us what a big difference this makes to them. Strongest and Biggest Bolts. Heavy Duty Hardware adds to the Quality construction and the more through-bolts, a more rock-solid feel for superior safety and structural integrity, which also means less maintenance. Coated Heavy Duty Swing Chains - Feel our chains and you will see the difference. Extra heavy Plastisol coating over galvanized beefy swing chains means no pinching of little fingers, no rusting and a comfortable grip. Heavy-Duty Swing Hangers are a must for all Rainbow Play Systems. Even dad can swing. With natural, sustainable redwood and aesthetic design, Rainbow Play Systems complements residential settings with unrivaled good looks. Rainbow Play Systems - The Leader Since 1985. Rainbow is committed to building the finest outdoor swing sets and playsets that help children grow and learn. Rainbow Play Systems is known for high-quality wood playsets of exceptional value and durable good looks. Our preference for natural materials comes with a commitment to the earth and a responsibility to sustain and renew its resources. You can trust Rainbow Play Systems as an environmentally sound swing set choice. We know how important it is for kids to exercise their imaginations as well as their muscles. With an emphasis on safety, long-term value, and choices that make it easy to customize your ideal playset, Rainbow Play Systems brings your family unlimited freedom to enjoy the benefits of wholesome, outdoor play. Let the Adventure Begin. Our Tough Standards Are Easy On The Environment. Our choice of U.S. based lumber suppliers attests to the sound environmental practices employed in growing and harvesting the domestically-grown wood we use in our Rainbow Play Systems swing sets. Your selection of the Rainbow brand reaffirms our support of sustainable forestry practices to ensure our earth's resources can meet the needs of present and future generations. The Right Team - Our Redwood supplier in California is so committed to habitat conservation, their efforts have been recognized by the U.S. Fish and Wildlife Service. The Right Methods - Our water-based wood stains are low in VOCs (volatile organic compounds) and safe for our children, our pets, wildlife, and the air we breathe. Our investment in advanced wood milling technology minimizes waste. We aggressively recycle to keep materials out of the waste stream. To reduce CO2 and other emissions, whenever possible we team with transit providers who participate in the U.S. EPA SmartWay(SM) transport partnership. Rainbow Play Systems is proud to serve on the board of ASTM International, American Society for Testing and Materials, a leading standards organization whose guidelines for product materials and testing are recognized globally as an assurance of quality and safety. National Playground Safety Institute - Playing outdoors is a major component in the fight against childhood obesity as well as the overall health of young people. Another commitment to your child's safety. As a proud member of NRPA, this organization is dedicated to educating professionals and the public on the essential nature of parks and recreation. Through learning opportunities, research, and communications initiatives, we strive to generate significant public support for our movement in order to advance the development of best practices and resources that will make parks and recreation indispensable elements of American communities.